BC Tree Fruits “There’s something in the water, soil and sunshine” newspaper ad. But the ad I saw in my local Vancouver Courier really left a bitter taste on my green palate. It wasn’t the design; this was tastefully done. It wasn’t the use of local grower Lindsay Hainstock from Osoyoos; I always appreciate knowing there are real people behind a brand. No, it was the hackneyed ‘it’s-so-beautiful-and-sunny-here-in-the-Okanagan-that-our-products-must-be-good-too!’ approach that left me rolling my eyes. Likewise in the radio spot. 1) BC Tree Fruits is a true co-operative: the growers own the packing houses, BC Tree Fruits Limited and their associated assets. 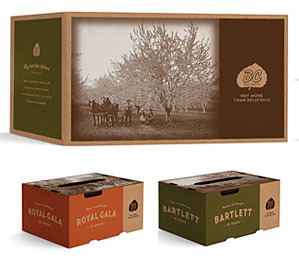 2) Over 800 Okanagan Valley families own BC Tree Fruits. Folks who every day put everything they have into tending their orchards. Okay, I’m over it now. Like I said, for the most part a beautifully redesigned brand. But a bit more flesh on that core idea would go a long way. By trademarking such a bold phrase, UNBC opens the door to closer scrutiny. But this SkyTrain poster does little to engage my imagination. “1st with Harvard” leaps out, but means little. Winning an award is not as important as what you win an award for. Once I visit their website and do a little digging, I find out that the reason for the award was UNBC’s Bioenergy Project that uses local forest fuels, (either in the form of wood pellets or residue from sawmill operations) to heat buildings and provide hot water on campus. Hello!! There are so many angles to this story, from playing off the campus’ cold northern location in Prince George to the more complex story of promoting a technology that could be a savior for BC’s forest industry, I hardly know where to start. And with all the smartphones I saw on that SkyTrain platform, a more intriguing web call-to-action would have been well rewarded. 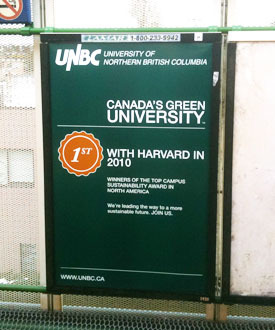 The Green Briefs Two-Bits: Use some of your University smarts to educate the public, UNBC. And who cares about Harvard?? So what do you think? Did I pick it right or does my review bite? Comments, please. Thank you, Ann. It takes a whole team to pull off such a fun project. Great clients too, are priceless! You are a gift to those brands who are not paying attention to their opportunities, Lorne. Hopefully through the blogosphere, some of their peeps will see your blog because of some of your peeps and you will be called in to reinvent the apple story and the university story so that we all benefit. That’s what I wish for in your Christmas stocking! Thank you, Lorraine! May an abundance of good Green Karma be upon you, too!